In December 1989 students took to the streets of Romania, first in Timişoara, then in Bucureşti and other towns, to protest the Communist dictator, Nicolae Ceauşescu, the lack of safety, freedom, and resources. At first peaceful, the protests turned bloody quickly as the police and army attacked the students. Many died. On December 22nd, 1989, the police and army joined the students – the revolutionaries – and together defeated the secret communist police called Securitate (which ironically means “Security”). I was only 12 when this happened, and I tell most people who ask me about my experience that I was old enough to understand what was happening, but young enough to think it was exciting, and not scary. My father, a physician, felt compelled to leave the safety of our house and go help. We thought the fighting was going on elsewhere, in some other distant place, but just a few minutes after my father left we heard gunshots down the street from us. We took some blankets, pillows, water, food, the dog and the cat and hid under the piano. It was the perfect hiding spot, really. The lid of the piano was exactly below the windows, so when the bullets started flying, we were protected. We noticed a pattern in the sequence of bullets, never just one, but several in a row, several minutes apart, so we got pretty good at listening for the breaks in order to run for the bathroom. My father returned to get more supplies; there were many wounded people to bandage. He told us they were all so young, university students, and probably even younger. He looked at me, and tears came to his eyes when he saw how excited I was about the whole situation. Looking back I finally understand his tears. He saw in me the reason for what was happening outside. The power of the young is their enthusiasm, energy and unapologetic belief in a bright future. This power is much stronger than their sense of safety. It is a force that can topple down governments and stand up to entire armies with a wildflower. Bringing up a child in a communist dictatorship implies the hope that that child will make history and change the country for the better. What my father saw in my enthusiasm was the bitter truth that those university students outside were willing to die so that the rest of the country – including their parents – could have a better life. Well, it is happening again, this time in Venezuela. Students have taken to the streets to peacefully protest the lack of safety, freedom, and resources. Many are dying. 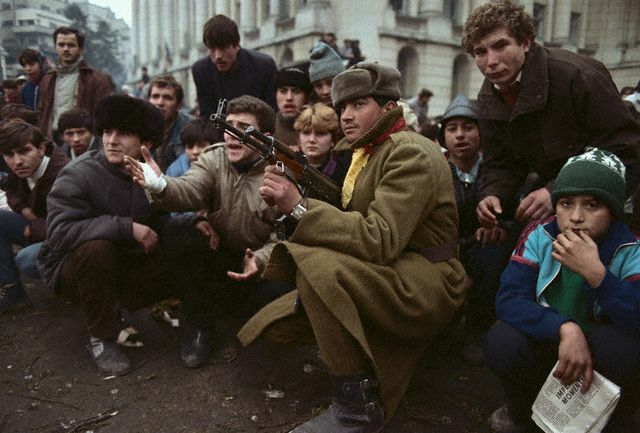 When the Romanian police and army joined the students in 1989, they did it because they were all the same age, and were all hoping for that bright future. Within hours, the revolutionaries took over the Television and Radio, and finally arrested Ceauşescu. Things in Venezuela are still happening, the police are still shooting at the people they are supposed to protect. I don’t know what the end will be, and when, but I am pretty sure the students will do anything in their power to get that bright future they deserve. Since all media from Venezuela has been shut down, it is very hard to know what is happening. I am sharing this video to help spread the news.